The question we get from readers more than any other is about the framework we use to identify these asymmetric opportunities. They want to know how to sift through all the noise and numbers and find the stocks that are going to make them money! That’s what we’re going to do in this month’s report. We’re going to discuss the different classifications of equity investing opportunities and then focus on our favorite, that of the long-term compounder. We’ll walk you through the first principles of value investing and then go through the step-by-step process of our framework for identifying stocks with massive long-term compounding potential. You may be asking, aren’t you guys macro traders? Why are you writing about fundamental value investing? That’s a fair question… You see, the key point about being a macro trader is that we’re not constrained by a rigid and narrow approach to markets. Our sole guiding philosophy is to make high risk-adjusted returns using whatever means necessary. This is a flexible and opportunistic approach. We care only about positive asymmetry and not about what tools or mental frameworks (ie, technicals, fundamentals, classical macro etc…) we need to use to find them. 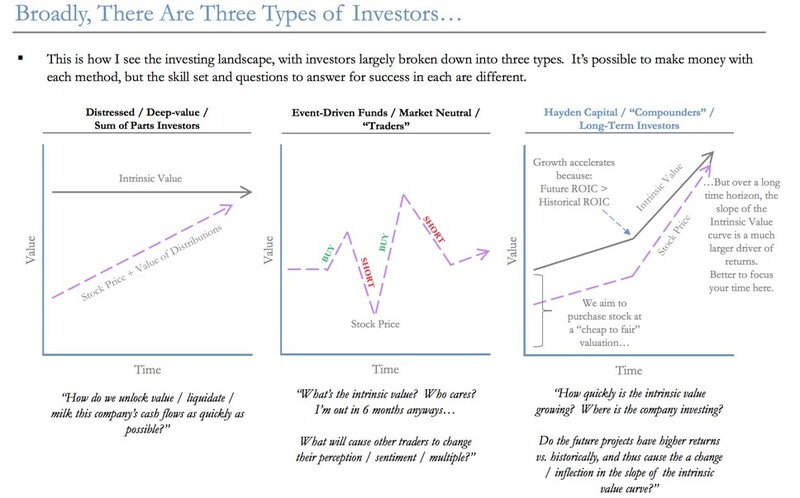 In reality, nearly every investment includes some combination of different factors and drivers. The best trades are the ones where the entire Marcus Trifecta of technicals, sentiment, and fundamentals align together in a fat pitch setup. Like a warrior going into battle we don’t see the utility in limiting ourselves to a single weapon or style of fighting. Similar to Bruce Lee’s Jeet Kune Do, we aim to use anything and everything that works to help us win. Value investing and understanding how to discover and identify long-term compounders is an essential tool in the macro trader’s toolkit. And that’s what we’re going to give you a master class in today. We’ll conclude by using this framework to analyze two stocks that we believe have long-term multibagger potential. Every investing framework and process we build needs to be built upon clear, simple, and universal principles. Let’s discuss what some of these are. Informational: They can be privy to information that the market is not; through proprietary data (ie, using satellites to track foot traffic at stores) or by extreme due diligence in less watched areas of the market (really digging into the micro cap space) or by less scrupulous methods (insider knowledge). Analytical: They can look at the same data but come to different and superior conclusions through greater due diligence and/or better frameworks for understanding the world. Behavioral: They have better understanding and control of their own nature and thus exploit behavioral anomalies that arise in markets largely due to short-term emotional overreactions. We briefly touched upon in last week’s note how the informational advantage has largely been arbed away due to the wide scale availability of powerful quantitative tools and screeners and information dissemination in general. At least for the retail investor, who doesn’t have access to proprietary credit card and store receipt data, and can’t plug into their satellite that’s tracking Walmart North American store traffic, they are left with the final two edges of analytical and behavioral — we can use this fact to our advantage. I actually want quantitative strategies to proliferate. I want money to pile into them, gobs and gobs of it. The more money into quant strategies the better, as I think they are likely to create distortions that I can take advantage of over time. You can have your backward looking quantitative data and use that for the foundation of your decisions. I would rather understand the product, market, and management team of the companies I am investing in. Our analytical edge needs to be in seeing the same data but assembling the pieces differently, in the hopes of creating a truer representation of the underlying business and its intrinsic value. Joel Greenblatt often mentioned in his investing class at Columbia that he believed he was only average at valuation work (he had little edge there), but where he excelled — where his edge lay — came in being able to put the information together in context; view things from the bigger picture and pinpoint the factors that really mattered. He only had access to the information everyone else had but he was able to piece it together to come to a completely different and more true conclusion — develop a variant perception. This is what an analytical edge is. So we know that our value investing framework needs to include mental models for viewing and interpreting data in a more useful way. It needs to help give us a variant perception of reality and strengthen our analytical edge. Which brings us to another foundational principle about value investing: The best value investments will always have a well articulated and very convincing logic as to why they’re priced the way they are. These bearish arguments will always be predicated on a certain amount of truth. It’s this convincing narrative that creates the large mispricing. The thing is, these narratives tend to build on themselves. As they become more popular they tend to extrapolate the negative data points on which they’re built, further and further out the left tail, driving the price lower and further away from probable outcomes. And like Howard Marks likes to say, there’s no such thing as a good or bad stock just good or bad prices. A value investor must use their analytical edge to develop a variant perception in order to capitalize off the market’s behavioral overreaction. Another aspect of behavioral edge is one of timeframe. The market which is becoming increasingly quantitatively focused has gotten very good at predicting earnings 1 to 2 quarters out. But with this short-term quantitative edge, comes the loss of long-term context and so the players in the market have become more and more myopic and short-term focused. This trend towards market myopia widens the behavioral edge for those willing to peer a little further into the future and play the long game in their investing. This is a kind of time arbitrage that allows a patient investor to capitalize on the market’s broader short-termism. For the market broadly, the recent trends are toward shorter investing time horizons and less active stock selection, which gives us confidence in our competitive advantages of long-term, actively managed investing. The average holding period for mutual funds is now down to just six months, compared to our time horizon of three to five years. We believe that the one constant in the markets is the behaviors of groups of people and the advantages provided by a focus of behavior inefficiencies. The broad features of human behavior have not changed, and social psychologists have mapped pretty well how large numbers of people behave under various conditions. We try to arbitrage between perception and reality in behavior. Our value investing framework needs to capitalize on our behavioral edge by objectively exploiting market overreactions — letting the fundamentals dictate our actions and not be reactive to short-term price moves — and arbitraging time by peering further into the future and being more patient with our investments. Utilize an analytical edge to arrive at a variant perception. Exploit behavioral driven market overreactions that result in large mispricings. Arbitrage time by playing the long game of peering further into the future and practicing infinite patience. Macro: These are trades where the primary driver of returns is from macro inputs and not due to individual stock specifics. Cyclical commodity stocks fall under this category where their returns are driven by the capital cycle and the price of the underlying commodity. Market timing and sentiment driven trades also fall under this category. Fundamental Value: These trades are primarily driven by the conditions and valuation of the underlying company. Fundamental value trades can be bucketed further into three separate categories. Classic value: These are the deep value sum of the part investments and the classic Graham net-net plays where the investment thesis rests on the mispricing of the company’s current intrinsic valuation; a valuation which depends less on the company’s future growth and more on the price given to its current assets and earnings stream. Special situation: These are Joel Greenblatt style anomalous mispricings caused by spinoffs or a host of other reasons. These aren’t typically long-term plays but are held until the valuation gap caused by an event is closed. Long-term compounders: These are the real money makers. These are the special stocks that grow in value exponentially over long periods of time. They are run by skilled capital allocators, typically with large amounts of skin in the game, and are companies with wide moats that allow for enduring returns above the cost of capital. These graphs below from Hayden Capital show the different intrinsic value growth curves and stock price path. It’s the graph over on the right hand side where we want to focus the majority of our time and which we’re going to discuss today. Long-term compounders are the stocks that can create generational wealth — if held on to. The problem is that they can be difficult to identify a priori but that’s what we’re going to solve for today. First, let’s start with a simple math exercise from Scott Miller that shows the incredible power of compounding. Example: We underestimate the power of compounding and the impact of difference in return rates over a long period of time. Question: What is the difference in ending capital between $100K that grows at 10% for 30 years vs. $100K that grows at 20% for 30 years? 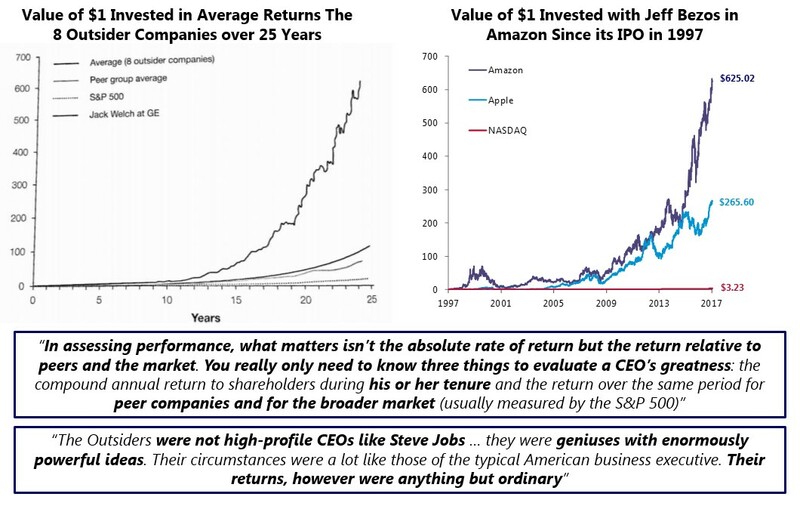 $21M+ dollars is quite a lot from just a 10% difference in annual returns over a long period. George Soros and Stanley Druckenmiller are both worth billions of dollars because they compounded money at an average of 30% return over decades! We’re linear creatures who think in logarithmic terms. But if we want to harness the 90/10 distribution of market returns and put the power of compounding to work then we need to think in and seek out exponential growth opportunities for our capital. Investing in a long-term compounder is essentially like allocating your capital to a compounding wizard like Druck or Soros. You can think of these companies almost as the best private equity firms, but ones with access to niche markets and the best information and deal flow available; along with an appropriate incentive structure that creates the opportunity for extraordinary alpha. William Thorndike’s excellent book The Outsiders is a case study of the 8 best long-term compounders and the operators who ran them. Below are graphs to show the difference in returns over long periods of time that identifying and investing in a long-term compounder, an Outsider stock, can provide. Hopefully, you now get my point about the power of long-term compounding and exponential growth and how finding these stocks can be life changing. Understanding the power of compound growth and factoring that into your value analysis makes for a big analytical edge. Okay, great! So now how do we find them… What makes one stock a long-term compounder and another just average? For the answer, click here to sign up for the MIR. The latest issue includes our Macro Ops Long-term Compounders Identification Framework (MOLCIF) that you can use to find exponential growth.